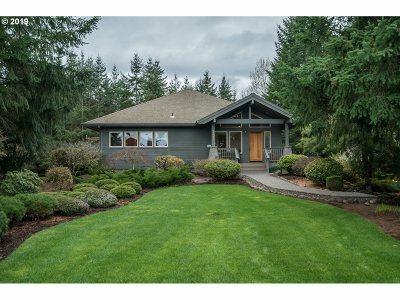 Custom built high-end NW Entertainers Home! Designed by renowned local chef, w/exacting standards! Large open floorplan complete w/vaulted cedar ceilings, hardwood floors, cabinets & built-ins, gourmet kitchen, eating bar & nook, expansive dining room, spacious living room, huge wrap around deck, all w/a beautiful Mt Hood view! Master bedroom with fireplace, jetted tub, walk-in, & vaults. All on a 3-acre lot w/a beds & manicured yard.